With all the rain, snow, and slush we’ve had in New Jersey, Wizard has not had a lot of time to stretch his Thoroughbred legs. I threw out my back and have not ridden in almost a month, so the best exercise I can give him is to turn him loose in the arena. Since my back is (FINALLY!) feeling better, I decided it was time to get back in the saddle. Before I rode, I turned him loose in the indoor arena. Naturally, the first thing he did was roll. And then roll again. And then roll a third time. Snort, shake off the dirt. And trot around. And RUN. Thankfully, it’s a contained run, but a run nonetheless. 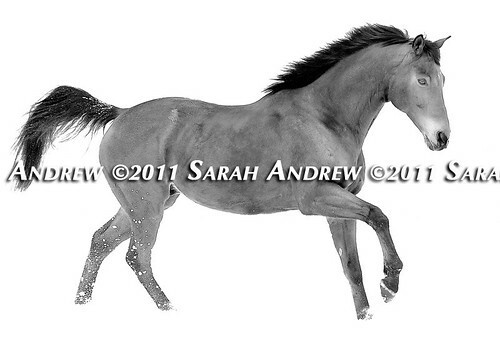 The horse loves to run- he really lets go in the big outdoor arena, but he enjoys the indoor as well. After he got his ya-yas out, I tacked him up and rode for about 25 minutes. Wow, do I miss riding! Hopefully my back won’t be pulling any more dirty tricks and I won’t ever have to miss that much saddle time again. Wizard is refreshed from the time off, and was very receptive to my riding. Our ride was light, with about ten minutes of trot work and walking for the rest of the time. I worked on my hands, keeping them in contact with the bit instead of “fiddling” and fussing with them. Hopefully it will NOT be another month before I ride again! My OTTB runs like a fiend several times a week. Hard enough/fast enough that it’s scary, and I can only let him run after longeing him to warm him up for fear he’ll pull more muscles (as he has in the past.) And enough, with enough obvious need for room, that we bought horse property and are building a run off his stall which will be approximately 200’x140′ so he can be out all the time. They’re both fun and exhilarating to watch… and terrifying! The day I put him in a new arena with jumps and he spent 15 minutes walking/trotting/pawing in corners to test the footing before he ran, then followed the same path for maximum full-out gallop about 10 times in a row, including two lead changes and a rollback at the same spots each time, I figured out that he’s not nearly as out of control as he looks! It’s taking over the world! Playtime, thoroughbred-style. Love it. My OTTB gave his current BO heart failure the first couple times she turned him out in a big field. The resident warmbloods at her place don’t have the same “Whoopee” response to wide open spaces.